Is there a space that might be enlivened by a mobile? I am Arthur Bauman. The photos you see on this site are of mobiles I have made in recent years for private residences and corporations. They are meant to give you an idea of the calibre and variety of my work. 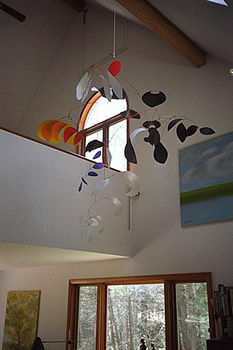 Each is a unique kinetic mobile sculpture, hand-made of metal. Most are painted with artists' acrylics, but some are hammered aluminum, bronze and brass. I do enjoy making mobiles. In beginning a new abstract mobile I often simply form a first shape, decide what next shape might both complement it and open the way for a third, and continue in that way until I find the mobile balanced and complete. This involves a logic internal to the mobile that dictates the limits both to its shapes and to its structure. I find this intriguing. I would be delighted to be commissioned to build a site-specific mobile for you.